Cacao has been revered in its native Peru for thousands of years. There is archaeological evidence dating back 3,000 years of the Mayan and Aztec civilisations making a beverage from whole cacao beans. The beans were so prized they were used as currency and featured in religious ceremonies. Beverages prepared from the beans were thought to promote vitality, boost energy and mental clarity. Today cacao beans are peeled to remove the inner nibs, which are then pressed to remove the butter. Rich and creamy, cacao butter is used to make chocolate and is also utilised in many skin moisturisers and body butters. Once the butter is extracted, what remains is then milled into cacao powder. Looking at the chemistry, we can begin to understand why this ancient Aztec wisdom may have developed. Cacao beans and their derivative products contain a group of antioxidant compounds called cocoa polyphenols which can be great for our health. Cacao powder boasts an impressive ORAC (oxygen radical absorbance capacity – the scientific measure of a food’s antioxidant value) of up to 95,000 TE/g. The free radical scavenging potential of cacao powder is more than 20 times that of blueberries and has greater antioxidant capacity than that of green tea and red wine. Cocoa polyphenols are a group of naturally occurring antioxidants that form part of the plant’s defence system against external stressors such as pathogens, predators and UV light. When consumed by us they remain active in our bodies, giving us positive effects. 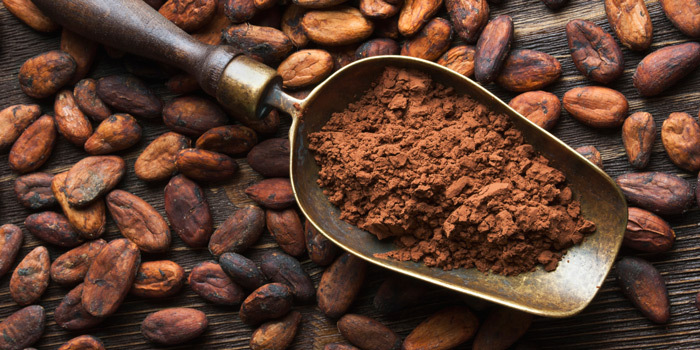 One group of these polyphenol antioxidant compounds are cocoa flavonoids, which have been the subject of hundreds of studies investigating their benefits on cardiovascular health. It is now accepted that cocoa flavonoids have a beneficial effect on cardiovascular health, blood pressure and healthy cholesterol levels. Furthermore, epidemiological studies have shown that the relationship is dose dependant, meaning higher consumption may result in a greater benefit. It is important to note that not all cacao or cocoa products are created equal – some chocolate is high in sugar and should be consumed only in moderation as part of a balanced diet. Cocoa flavonoids have also been shown to improve skin health and have anti-ageing properties. Even when consumed orally they have been shown to improve microcirculation and hydration of the skin, as well as protect the skin from the damaging effects of UV exposure. In addition to these antioxidants, cacao contains a group of psychoactive compounds called methylxanthines – most notably theobromine and caffeine. Theobromine is related to caffeine and has similar structure and activity. It has also been shown to improve mental alertness and promote concentration. However, theobromine does not exert the same negative side effects that have been associated with a high intake of caffeine. Whilst caffeine is present in cacao, the quantities are small: a mug of hot cacao could deliver as little as 5mg compared to 200mg in an espresso. Cacao also contains two chemicals termed “bliss” chemicals. Phenylethylamine, or PEA, is produced naturally by the body when we are excited and when we fall in love. Some studies have also shown it may be helpful in relieving stress and increasing alertness. The other “bliss” chemical found in cacao is called anandamine. Our bodies make anandamine in the brain where it acts as a messenger chemical – having an effect on pain, appetite, mood and memory. It stimulates canabanol receptors in the brain, producing feelings of delight and joy. Indeed, the name is derived from a Sanskrit word ananada meaning bliss. In addition to the myriad benefits from phytochemicals, cacao is also highly nutritious. It is one of the highest food sources of magnesium, a mineral involved in over 600 reactions in our bodies. Magnesium is a vital electrolyte, essential for cellular energy production and optimal functioning of the nervous and cardiovascular systems. Cacao is also a good source of minerals iron, potassium, chromium and sulphur. At over 25 per cent protein, cacao is also a good source of plant based protein and dietary fibre, which accounts for over 40 per cent of the total weight of the powder. The health benefits of cacao far exceed the sum of these nutrients, and may further extend to improved cardiovascular health, improved mood and even skin health. Inspired to incorporate more cacao into your diet? Try the Power Super Foods cacao range, including Cacao Powder, Cacao Nibs, Cacao Beans, Cacao Crunch and more. Power Super Foods cacao comes from the Criollo variety of Theobroma Cacao – a rarer source of cacao accounting for only five per cent of the world’s cacao production. Criollo has a complex flavour profile of spice, fruit and citrus notes. It is preferred by premier chocolatiers around the world.